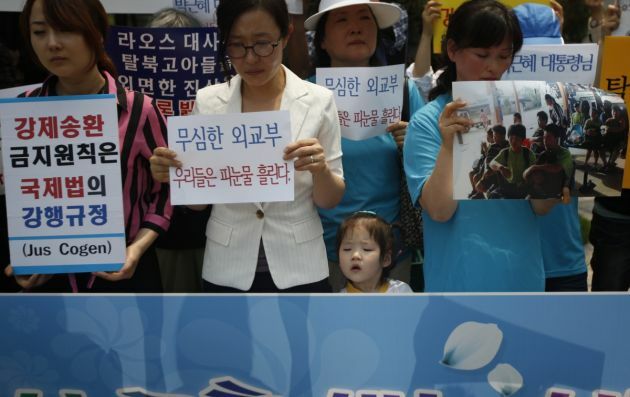 (Photo: Reuters / Kim Hong-Ji)A young girl stands between protesters from a human rights group during a rally against what the U.N. believes is the recent repatriation of nine North Korean defectors from Laos, in front of the Foreign Ministry in Seoul June 5, 2013. The picture (R) shows North Korean defectors, who according to the group, were sent back to China last week from Laos after trying to cross the border. China warned the U.N. High Commissioner for Refugees on Monday against making "irresponsible remarks" about nine North Korean defectors the U.N. believes were repatriated to their isolated, authoritarian homeland by China last week. The sign (C) reads, "we shed tears of blood due to indiferent government" and the sign (L) reads, "human rights accountability is compulsory provisions of international law". A former key cabinet minister involved in the task of unifying Korea says 60 years after the war that divided his country suspended in an armistice is the time to hammer out a peace settlement. "A new framework for negotiation for peace and unification of the Korean peninsula is the need of the hour…especially in the context that the armistice agreement declared 60 years ago lost its effect," said Dr. Lee Jae-joung, former minister of the Ministry of Unification of South Korea. He was speaking Tuesday at an international conference on Asian peace and security being held in Tsuen Wan, Hong Kong, June 3 to 6 organized by the Commission of the Churches on International Affairs of the World Council of Churches and the Christian Conference of Asia. The meeting titled "Asia's Human Security Challenges: Towards Peace with Justice in North East Asia" was one of a number of gatherings before the once every seven years meeting of the WCC's highest governing body, its assembly, that will take place in Busan, South Korea from October 30 to November 8. "The armistice agreement never brought peace in the Korean peninsula," said Lee who was unification minister from 2006-2008 said. The Korean War took place for June 25, 1950 – to July 27, 1953 between South Korea, supported by the United Nations backed by the United States and its allies, and North Korea, at one time supported by China and the Soviet Union. "There were constant violent conflicts at the truce line, as well as military infiltrations in the past years which affect peace and security," noted Lee in his presentation titled "From the Armistice Agreement to Peace Treaty in Korea. "The international ecumenical community has to perform the important task of mobilizing the international community to ensure lasting peace in the divided country of Korea," the former South Korean aide said. At the same conference, Prof. Sachio Nakato of Ritsumeikan University in Japan said, "The framework of the six-party talks should play a key role. The U.S focuses more on managing the North Korean nuclear issues rather than solving the problems through the framework of the six-party talks." The six-party talks are multilateral negotiations that have been held intermittently since 2003 and attended by China, Japan, North Korea, Russia, South Korea, and the United States for the purpose of dismantling North Korea's nuclear program. The talks are hosted in Beijing and chaired by China. During a biblical and theological reflection on the Korean situation the general secretary of the Presbyterian Church of Korea, Rev. Hong Jung Lee, said, "Healing and reconciliation sustain the integration between justice and peace and their coexistence for life.